I’ve been asked that question many times and really it depends on the character. Some are more complex than others and if you talk about Luke Skywalker in ROTJ, well it really is different from Old Ben. 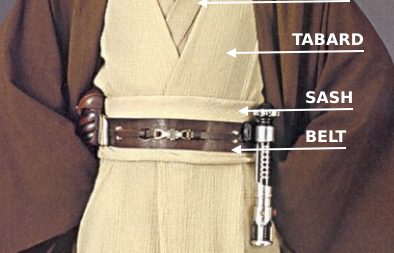 That being said there are “standard” components that one can use a a strong reference to create what we would call a generic Jedi. So find yourself a cool Jedi Name, go fabric shopping ( hint: the robe must be heavy and thick old military blanket style) while you want the pants and inner tunic in cotton for comfort; get someone to help you make the costume and head over the Rebel Legion for tons of info … like everything else you should first research and be patient.